One of the reasons that baked donuts have become so popular is that they are much easier to make than deep fried donuts are. They require less cleanup and are a bit healthier, making them a better everyday breakfast choice for most of us. 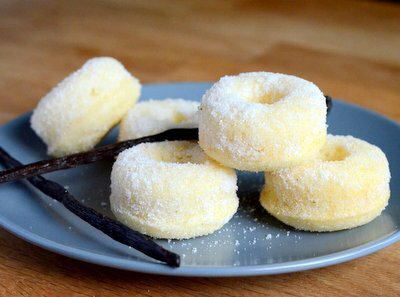 These Vanilla Bean Mini Donuts are one of my favorite everyday donut indulgences. They’re baked, not fried, and their miniature size makes them perfect for pairing with coffee in the morning and tea in the afternoon. The donuts start with a buttermilk cake donut batter that is seasoned with nutmeg and vanilla. They have a subtle flavor that is very similar to that of traditional cake donuts, and the nutmeg adds a hint of peppery spice that seems to set off the vanilla. Most of the vanilla flavor comes from the vanilla sugar that the donuts are rolled in after baking. The sugar will actually to the warm mini donuts when they are hot from the oven because the steam escaping from them will allow the sugar to stick in place. That said, I find that the donuts get a much better coating of sugar if they are lightly brushed with butter (you can dip them or use a pastry brush) before being rolled in the sugar. I keep vanilla sugar on hand at all times, storing leftover vanilla beans in a large container of sugar in my pantry. If you don’t have any on hand, you can make some quickly by scraping a vanilla bean into about two cups of sugar and stirring it until the vanilla bean seeds are well-distributed. You will need a mini donut pan in order to bake up a batch of these. If you don’t have one, the recipe can easily be adapted to work in a mini muffin pan by extending the baking time for a couple of minutes. The finished mini muffins should pop easily out of a well-greased pan and they can be tossed in vanilla sugar, just like the mini donuts. You can also bake these in a full sized donut pan for larger baked donuts. Either way, be sure to use a toothpick to check your donuts for doneness if you decide to bake them in a different pan size to ensure that they turn out moist and tender, not dry. That said, if you do accidentally overbake your donuts, you can always dunk them in coffee, tea or milk as you eat and you won’t even notice! Preheat oven to 350F. Lightly grease a 24 cavity mini donut pan. In a small bowl, whisk together flour, baking powder, salt and nutmeg. Pour into egg mixture and stir to combine. 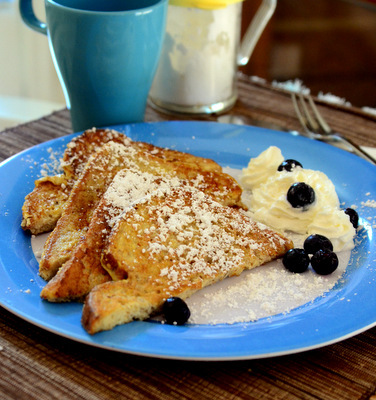 Pour in vegetable oil, milk and vanilla extract. 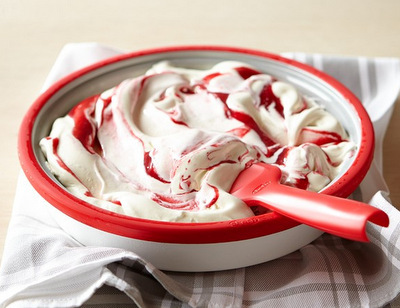 Scoop batter into a large zip lot plastic bag or a piping bag. Snip the corner off of the plastic bag and pipe batter into mini donut cavities, filling each about 3/4 full. Bake for 11-12 minutes, until donuts spring back when lightly pressed and a toothpick inserted into the center comes out clean. As the donuts come out of the pan, quickly dip the tops in butter and roll the whole donut in vanilla bean sugar. Transfer to a wire rack to cool completely. 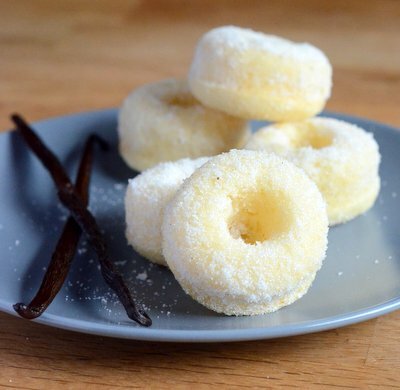 Mini doughnuts rolled in vanilla sugar? You got me. These look amazing. I love doughnuts that are easy to make, healthier and delicious! Great recipe! i suppose “1 buttermilk” means 1 cup? the dough was a little runny. How much buttermilk do we need? The recipe only says 1 buttermilk. Hi, may I know how much buttermilk you use? You wrote 1 buttermilk, 1 cup? I don’t make the sugar. We eat them with nutella and they are the best I’ve ever had.